Experts at customized production work, powder coating, metal household items, high temperature ceramic header coating and powder coating’s efficiency. Adam Mitchell and his family welcome you to come and find out what a difference the personal touch makes in your overall powder coating experience. Since Adam is ultimately responsible for every aspect of the work that leaves our shop, he makes sure that customer satisfaction is everyone’s number one concern. The entire Mitchell family takes part in providing a quality experience at Electro Tech. Adam’s wife, Denise, tends to the bookkeeping and accounts payable while also managing Adam’s busy family and household. Allen (Adam’s Dad) serves as Job Estimator and Troubleshooter, but most of his work is behind the scenes, keeping tabs on the operations and making sure that everything continues to run smoothly. Adam’s mom and brother help out, too. Linda does some of the computer work and Scott fills in when we need an extra hand to get a job out in a hurry. Our driver, Norm Reynolds, also happens to be Adam’s father-in-law. We are lucky to have him as our personal liaison to some of our commercial customers. Norm never seems to have a bad day. We count on him to safely pick up and deliver finished goods almost every day. You’ll find current news about us and photos of our customers’ finished products on our FACEBOOK page. Mike Danjou is Adam’s long-time friend and a very talented fabricator in his own right. Mike manages our day shift of powder coating employees and often puts his personal touch to items that require special attention. We rely on Mike to assure that our quality is second to none. Bud Balmer is also a long-time friend and reliable supervisor for the evening shift. 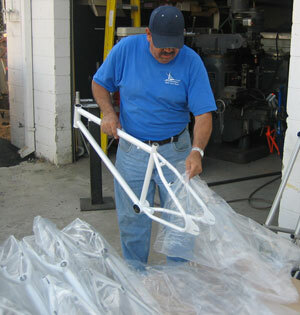 We count on Bud to oversee our production jobs, keep the crew on schedule, and load the truck for delivery the next day. If you call us, Rebecca Flowers is your first point of contact. She may also be the first to greet you at the front desk. Rebecca does everything from taking your order to bringing you your finished product. She keeps track of the schedule and sends out our invoices. All of these jobs, she handles with ease. Electro Tech very much appreciates its two shift crews; most have been employed with us for many years. They are the “nuts-and-bolts” of what makes us good at what we do. Their job is dirty and hot, but they rarely complain and do their individual jobs well. San Diego powder Coating by Electro Tech Coatings serves all of San Diego county and surrounding areas and you can contact us at 1 (760) 746-0292.